TAMPA, Fla. (April 8, 2019) – FOX Sports Sun announced the regional television schedule for the Tampa Bay Lightning’s first round playoff series versus the Columbus Blue Jackets, beginning with Game 1 on Wednesday, April 10. Live coverage of Game 1 starts at 6 p.m. with the Lightning Live pregame show from AMALIE Arena. FOX Sports Sun will extend Lightning Live pregame show coverage to one hour for every home game in the first round. 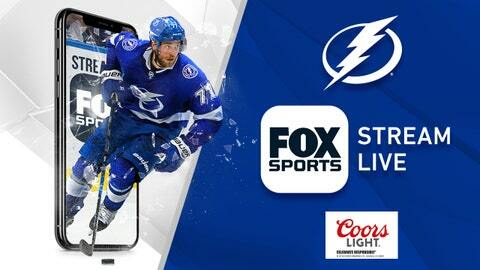 Also scheduled to begin on Wednesday, FOX Sports Sun will bring the “Lightning Morning Skate Show” to the network at 10:30 a.m. statewide on home game days and 11:30 a.m. on road game days. Finally, Lightning fans can get their first-round fix on FOX Sports Sun starting tonight at 5:30 p.m. with the premiere of the “Lightning Playoff Preview 2019” show. This 30-minute program will reflect on the Lightning’s historic regular season, look back at the team’s road to capturing the Presidents’ Trophy and look ahead to the road to the Stanley Cup. Play-by-play announcer Rick Peckham and color analyst Brian Engblom will provide viewers with expert commentary throughout the first round, while host Paul Kennedy will join analysts Dave Andreychuk and Bobby “The Chief” Taylor on the broadcasts. Former Lightning player Adam Hall will join the broadcast as a special guest analyst for select games throughout the first round.